– Packaged USP Sodium Chloride. (Pharmaceutical Grade)Called NeilMed NeilCleanse Piercing After Care * or non-iodized sea salt mixture: Dissolve 1/8 – 1/4 teaspoon of non-iodized (iodine free) sea salt into one cup (8 oz) of warm distilled or bottled water. A stronger mixture is not better! Saline solution that is too strong can irritate the piercing. We are happy only to use NeilMed NeilCleanse Piercing After Care to heal our quality body piercings. We only use the highest quality body jewelry so why wouldn’t we use the best healing products available? We sell what we use! NeilMed NeilCleanse Piercing After Care. 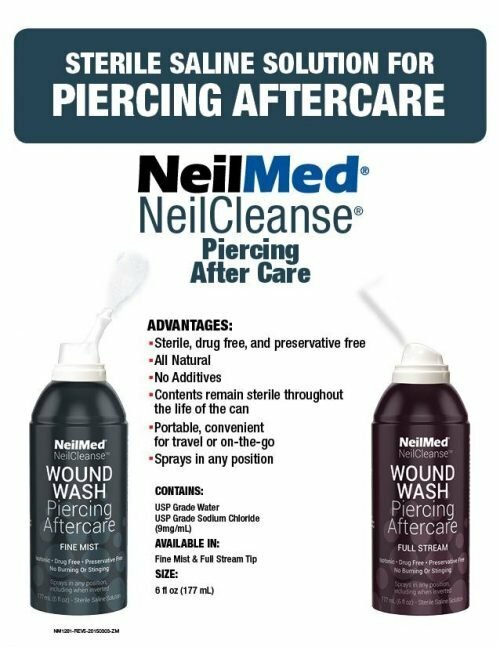 A handy and efficient way to clean your piercings so use NeilMed NeilCleanse Piercing After Care. We do! – During healing: some discoloration, itching, secretion of a whitish-yellow fluid that will form some crust on the jewelry. The tissue may tighten around the jewelry as it heals.